With the convergence of Mashup building platforms lately I thought I would try to Supersize this concept. That got me thinking of the "Ultimate Web Mashup". In one corner you have w/ a Combined Market Cap of $325B "MicroHoo" and in the other corner you have the King of Search and the King of Commerce "Googlezon". K..so all kidding aside what would the web be like if these four companies morphed into two titans? Now lets look at these mergers..first lets take a look at the Microsoft/Yahoo tandem. 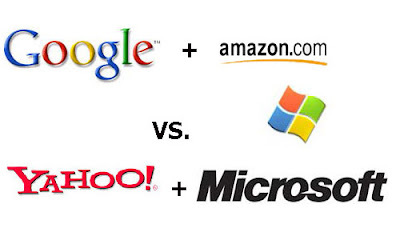 It seems like a decent match if you look at it from the point that Yahoo and Microsoft both are jack of all trades , masters of none... It's a no brainer in terms of obtaining market share in search appx. 41%. to Google's 51%. Microhoo could def. flex it's muscle's in the Media area as well. Publishing could explode to the mainstream with this combination. They already are sharing the IM space together so that's a start. This Mega-Power could develop a "new media landscape" which would challenge TV. With it's combination of bringing media to the home flawlessly.. NBC/Flickr/Blogs/Videos etc.. The Google/Amazon tandem on the other hand has a more of natural relationship...their users are alike (smart/loyal) and their services are alike.. S3/EC2 which goes hand in hand w/ cloud storage and hosting that Google benefits from via Google Docs and Spreadsheets etc...And the possibilities in Search would be major as well.. imagine integrated Google Book Search via Amazon listings this could also tie into products and videos as well via Froogle and Youtube. Then the most compelling aspect to this merger would be the e-commerce implications. Hmmm what if they tied Google Checkout / Amazon E Commerce /Adwords / Amazon Historical Pricing /Amazon Affiliates etc together... Googlezon could effectively chew up 51% of all online transactions! With it's combined data capabilities Web 3.0 could be here quite quickly. Think about the efficiency in which services could be rendered. Yikes! it's scary..
Mashups would be amazing combining Google and Amazon services that users could create vertical hubs that would maximize the Long Tail effect. Advertisers would see higher click thru and transaction rates due to amazingly targeted content. These are just some random thoughts..I would be happy to hear your thoughts on this topic. Here is a video that has been around quite awhile but is still fun to watch especially how fast things are going right now in comparison to the time-line in this video.